You can print the results of your work in the Webix SpreadSheet. This functionality is provided out of the box. Read about the Print API and printing options in the related guide. Both these actions envoke the dialog window that provides you with the available printing settings. There are three sections: General Settings, Paper Size and Layout. 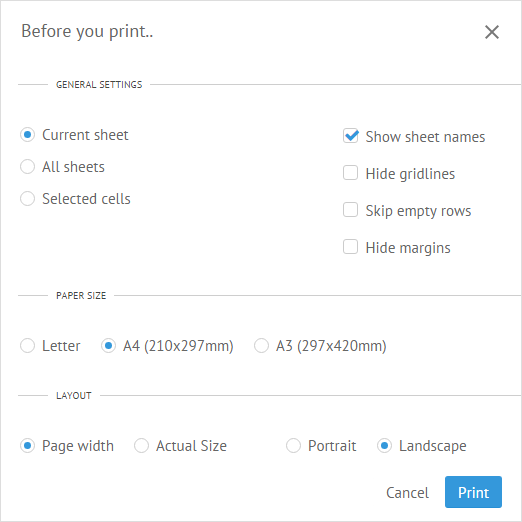 The Paper Size section lets you define the desired paper size for printing: "letter", "a4" (default) or "a3". Read more on SpreadSheet localization in the related article.